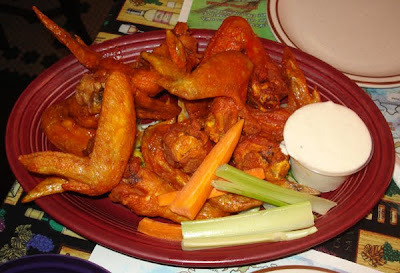 A lot of people consider Moriarty's to be THE place for wings in the city. Well I disagree, but they do have some delicious bar food. My main point of contention on the wing front is the fact that they don't split them, just serve a whole wing. This just does not do it for me. I ducked in recently to watch a playoff game, and figured that since I've had the wings, I should try something from the usual bar menu. The French onion soup sounded good, but I figured it would be overly salty, and mediocre at best. I don't usually order out of spite, but I guess I was really on a roll. They completely proved me wrong, offering a cheesy, well browned large crock of rich soup. The bread inside was more than ample, and was easily apportioned in its crouton sized pieces, with the deeply caramelized onions and plentiful mix of Swiss and provolone cheeses. I know this is a simple dish to make, but so many places get it wrong. Too salty, too little broth, uncooked cheese, raw onions etc. It was nice to see my previous assumptions defeated. Looking for something light(ish) to accompany the soup, I felt that the blue burger, served with blue cheese and bacon, sounded perfect. Except I subbed out the burger for grilled chicken. And I ordered a side of wing sauce to go with. Despite the quirky service, (upon being asked if it came with fries, the server responded "very") it came out correct, and was also better than I had expected. The chicken breast was thin, and the tips came out just about burnt, my favorite part of grilled chicken. The wing sauce is good, but heavy on the vinegar, and certainly nothing to write home about. Breaded fries get me every time, and this was no exception. All in all, a quick meal at a divey bar turned out to be just the ticket. Great wings and secretly REALLY GREAT cheese fries too. My buddy once asked a Moriarity's waitress out and after going on a few dates and calling it quits, he had to ABANDON going to Moriarity's for fear of dealing with her! I have a friend who has done the same at a similar bar. However, I still force him to go there, throughly embracing the awkwardness that ensues.